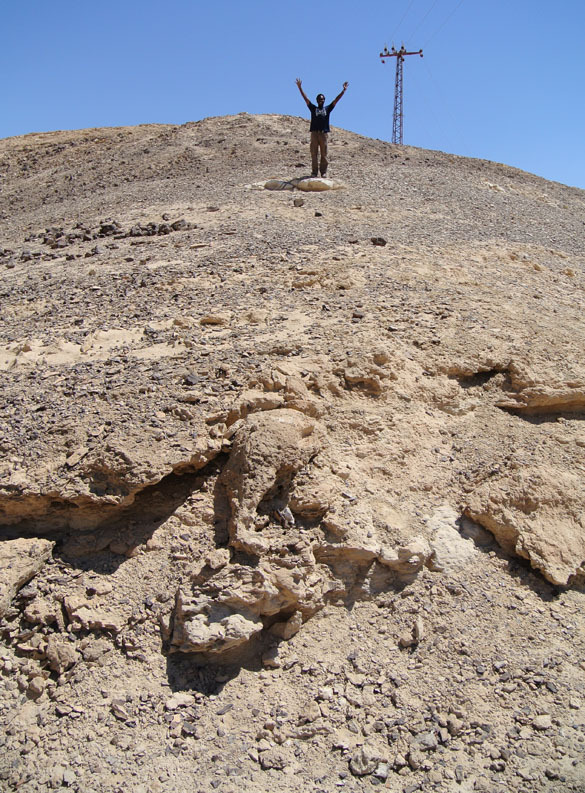 MITZPE RAMON, ISRAEL–Oscar Mmari celebrated on his second outcrop today the completion of his stratigraphic columns for his project on the phosphate-bearing portions of the Mishash Formation in the Negev of southern Israel. It is certainly the least pretty section we’ve worked with because it is in the industrialized mining zone near the eastern outlet of Makhtesh Gadol, but we got the work done. This particular place is at N 30.94072°, E 35.03784° (for those of you following along). Look at this place on Google Earth and you’ll see how extensive the phosphate mines are here. Oscar is not yet done with fieldwork because we will come back to his sections for further observations and collecting. Later in the afternoon we visited outcrops of the Matmor Formation in the northern part of Makhtesh Gadol. Just above Lizzie Reinthal’s right shoulder above (she’s in the center) the outlet from the makhtesh is visible as a break in the surrounding walls. Steph Bosch on the right is bravely hiding her disappointment because after lots of careful peering at the encrusted undersides of beautiful fossil corals, the four of us failed to come up with a single bryozoan. This is curious in itself. The encrusters are well preserved and diverse. (Olev Vinn and I wrote a paper on the various serpulid and sabellid worm tubes; Cezary Krawczynski and I have a paper on the thecideide brachiopods from here.) Every place we think we will see bryozoans we find instead worm tubes and calcisponges. The few Matmor bryozoans collected on previous field trips have been on echinoderm ossicles and holdfasts. Since echinoderms are common where corals are not, and vice versa, it may be that the bryozoans preferred the same conditions the crinoids and echinoids did. Later on this trip we will thus have a full-court press in the crinoid thickets and echinoid-rich beds. Still, the corals here are gorgeous. Here are two varieties of typical colonial scleractinians we saw today. 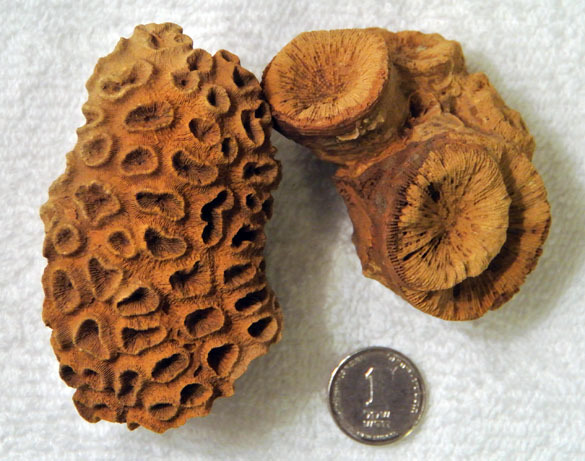 The one on the right has all sorts of encrusters in the nooks and crannies between its corallites. The corals here are remarkably well preserved considering that their original aragonitic skeletons have been replaced by calcite. These are a bit of consolation for the missing bryozoans!